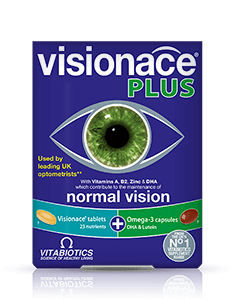 Visionace Max provides the maximum support in the Visionace range, combining the Visionace Original multinutrient tablets with high quality Omega-3 and Red Krill oil capsules containing additional Lutein Esters and Zeaxanthin, in a convenient dual pack. Visionace tablets include a comprehensive range of micronutrients, including vitamins A, B2 and zinc which contribute to the maintenance of normal vision. Red Krill oil is a special source of Omega-3 with a high concentration of marine phospholipids, so may be better utilised in the body. The DHA in Visionace Max is derived from a special combination of both Omega-3 Fish oil and Red Krill oil; DHA is scientifically proven to help maintain normal vision1. The retinal cells are continually being renewed, so a constant supply of Omega-3 fatty acids and in particular DHA is required6 7. Since these cannot be made by the body, a lack of these in the diet can have a direct effect on levels in the retina8. Fortunately increasing dietary intake can help to restore retinal Omega-3 levels9. Omega-3 fatty acids are now being recognised as being essential for normal eye health from before birth continuing into old age10. Lutein makes up the dominant pigment in the retina which absorbs visible blue light. 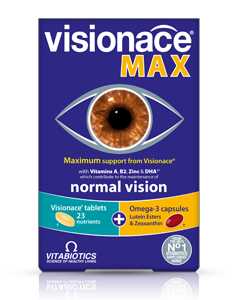 Visionace Max provides a combined total of 34mg of Lutein Esters. Zeaxanthin is a structural component of the macular which is the central area of the retina, containing the highest density of photoreceptors. Zeaxanthin cannot be made in the body, so must come from dietary sources, such as eggs, broccoli and spinach, as well as spirulina which can be added to smoothies. The photoreceptors in the retina are particularly vulnerable to the effects of UV rays in sunlight which can result in cellular damage11 12. Because of this, sunglasses with a high Eye-Sun Protection Factor (E-SPF) are always recommended to reduce the exposure of the eye to excessive light and harmful UV rays. Visionace Max provides vitamins C and E, plus zinc and selenium which contribute to the protection of cells from oxidative stress. Only the purest pharmaceutical grade fish oil is used in Visionace Max. To ensure maximum benefit, the oil is carefully concentrated to increase its DHA and EPA content and further purified. Each batch is rigorously tested, certified, and fully compliant with stringent EC and WHO rules on environmental pollutants. The Red Krill oil found in Visionace Max is sourced in the Antarctic using Aker BioMarine Eco-Harvesting technology to help restrict environmental impact and ensure the highest standards of quality. Visionace Max is a comprehensive formula that replaces other multivitamin supplements. The formula includes folic acid plus vitamins B12 and B2 which contribute to the reduction of tiredness and fatigue, as well as iron which supports normal oxygen transport in the body and has a role in the process of cell division. Visionace is used by leading UK optometrists and eye care specialists and is available online here. Vitamin C (Ascorbic Acid, Carrier: Glyceryl Tristearate), Bulking Agents: Microcrystalline Cellulose & Dibasic Calcium Phosphate, Magnesium Oxide, Vitamin E Natural Source (D-Alpha Tocopheryl Acid Succinate) (from Soya), Lutein Esters & Zeaxanthin Esters (Carriers: Sugar, Natural Vitamin E, Ascorbyl Palmitate, Cellulose Gum), Zinc Sulphate, Tablet Coating (Hydroxypropylmethylcellulose, Hydroxypropylcellulose, Caprilic/Capric Triglycerides, Natural Source Colours [Titanium Dioxide, Iron Oxides]), Pantothenic Acid (as Calcium Salt), Citrus Bioflavonoids, Anti-Caking Agents: Stearic Acid, Magnesium Stearate & Silicon Dioxide, Thiamin (Vitamin B1 as Mononitrate), Niacin (Nicotinamide), Ferrous Fumarate, Natural Mixed Carotenoids (Betacarotene, Starch, Water, Antioxidant: DL-Alpha Tocopherol), Vitamin B6 (Pyridoxine HCl), Bilberry Extract, Manganese Sulphate, Cross-linked Cellulose Gum, Riboflavin (Vitamin B2), Hydroxypropylmethylcellulose, Vitamin A (Vitamin A Acetate [Carriers: Maltodextrin, Gum Acacia, Corn Starch, Antioxidant: DL-Alpha Tocopherol]), Copper Sulphate, Vitamin D3 (Cholecalciferol [Carriers: Acacia, Sucrose, Corn Starch, Medium Chain Triglycerides, Antioxidant: DL-Alpha Tocopherol]), Folic Acid (as Pteroylmonoglutamic Acid), Sodium Selenate, Chromium Trichloride, Potassium Iodide, Vitamin B12 (Cyanocobalamin). Allergy Advice: For allergens, see ingredients in bold. Omega-3 Fish Oil (High DHA Fish Oil) (from Fish), Capsule Shell (Pharmaceutical Grade Gelatin [Bovine source], Glycerol, Natural Source Colour [Red Iron Oxide]), Lutein Esters (Carriers: Vegetable Oil, Antioxidant: Natural Vitamin E), Zeaxanthin (Carrier: Sunflower Oil), Lipid Extract from the Crustacean Antarctic Krill Euphausia Superba (from Crustacean), Silicon Dioxide. Allergy Advice: For allergens, see ingredients in bold. One Visionace tablet per day, plus one Omega-3 DHA & Krill oil capsule per day with your main meal. Swallow with water or a cold drink. Not to be chewed. Do not exceed the recommended intake. Visionace Max should only be taken on a full stomach. Food supplements must not replace a varied and balanced diet and a healthy lifestyle. As with other food supplements, consult your doctor or pharmacist before using if you are under medical supervision, pregnant, breast-feeding, have epilepsy, a thyroid condition, haemochromatosis, suffer from food allergies, or are allergic to any of the ingredients. Not suitable for children. Allergy Advice: For allergens, see ingredients in bold. Made in a site that may handle nuts. This product will not affect the lens prescription required in long and shortsightedness and astigmatism. Store below 25°C in a dry place, out of sight and reach of children. Why has Visionace Max been developed? When is Visionace Max recommended? How pure is the fish oil in Visionace Max? How pure is the Red Krill Oil? Can Visionace Max help with conditions such as Glaucoma and 'Floaters'? Can Visionace Max be used simultaneously with medications? Will Visionace Max have any effect on lens prescriptions required in long and short sightedness and astigmatism? How many tablets and capsules does one pack of Visionace Max contain? How and when should Visionace Max be used? Are there any undesired effects whilst taking Visionace Max? Is Visionace Max suitable for vegetarians? *The beneficial effect is obtained with a daily intake of 250 mg of DHA.